In trying to commemorate this Christmas on Infinite Earths... in July special I was thinking about ways to temporarily customize the blog. I thought of doing the whole "snow falling" thing... and even the "string of blinking lights" thing. Both looked wonderfully tacky, but for now I'm gonna go without. Maybe I'll change my mind as the week rolls on, who knows... I figure at best it may tickle some visitors, and at worst it'll turn 'em off... or think this blog hasn't been updated since last December. It's Christmas-time in Hollis, Queens... and Metropolis! Clark Kent is getting caught up in the holiday spirit. Soaking in all the jolly conversation around him, including a fella excited to have his wife's "aunt flo" over for the holidays... hmm... different strokes, I guess. The jovial discourse is sadly interrupted by some foul language coming from some six blocks away. Clark figures, this may just be a job for Superman! Upon arrival, Superman finds a group of construction workers whose crane engine is shot. They cannot complete their build, and as such, forfeit their Christmas bonuses. Well, lemme tell ya, that ain't gonna happen on Superman's watch! He hoists the girders and beams all by his lonesome, and the workers are able to complete their job. Although he'd much rather stay atop the building with the workers and sing Christmas carols, Clark Kent is due in at The Daily Planet for his... last day. Clark has accepted a job as Managing Editor of Newstime. As Clark enters the Daily Planet offices, he finds that he's getting the cold shoulder from all of his soon-to-be former co-workers, including (and especially) Lois Lane. She hands him a box, and Clark is surprised and disappointed to find that it's empty! It's not a gift... just something he can use to clean out his desk. We shift scenes to a Rocky Mountain research center. We see the somewhat ethereal visage of Brainiac tormenting a rather chubby Lex Luthor. Brainiac and Dr. Happersen transmit a faked video "greeting card" of sorts, featuring Lex Luthor doling out some rather generous Christmas bonuses to his entire staff! Back at the Planet, Clark is emptying his desk. He is interrupted by Perry White who calls him into his office. Once there, Perry and Clark share a touching moment. I really like the almost Father-Son dynamic between the pair. Perry may be a curmudgeon from time to time, but you always know he cares about his people. He tells Clark he knows he's up to the challenge of his new position, and assures him he'll always have a home in his newsroom. After the chat, Clark reenters the newsroom to find himself the recipient of a surprise farewell party! All the cold shoulders were a put-on. Lois, Cat, and the entire Planet staff all join in wishing Clark a bon voyage. We also learn that Alice the Intern had put the entire affair together. Clark becomes melancholic and starts walking the halls of his soon-to-be former place of employ. He passes the storage room that he'd used to change into Superman in many times in the past. He reflects for a moment, and before he can walk away, believes he hears crying coming from the other side of the wall. Using his x-ray vision, Clark is able to see Alice the Intern sitting on the floor, crying. Clark knocks to see if she needs any help. Before she can let him in, he takes it upon himself to barge in. He catches her rolling up a sleeping bag. Rather than lie, Alice comes clean, admitting that she has been living in the storage room. After Alice finishes her story, Perry flat-out states that he will not allow her to spend another Christmas in a storeroom. He calls the printer, and demands the presses be stopped! He has an editorial he wants printed in tomorrow's edition (on the cover, no less!)... from the image, he also wants his picture on the cover of the paper. The next several pages are Perry's editorial. He discusses what people can do to help the plight of the homeless. As the piece continues, we watch as the Planet staffers (and Superman) do what they can to help out. It's a touching, well-done scene... but I gotta admit... it's quite "very special episode" by this point. A bit later, we find Alice staying at the White's house. To avoid confusion with Mrs. White who's also named Alice, homeless-Alice decides she'll go be Allie. Perry enters, and tells Allie that she is more than welcome to stay with them until she gets back on her feet. Allie excitedly accepts the offer, and embraces Perry. He also says he's going to try and get her back-pay for all the extra hours she'd put in over the past three-years... hmm... not sure it really works that way... maybe they can just write that off as "room and board", eh? We end our Christmas tale in Smallville. Superman arrives at the Kent farm where Ma is baking perhaps the finest mince pie ever plopped in a plate. A recovering Lana Lang is also present... and will be spending the holidays with the Kent family. We wrap up with a special eggnog toast... Merry Christmas one and all! Had a lot of fun reading this one... but, I'll concede it veered perhaps too far into "very special episode" territory. I don't remember a whole lot about Alice the Intern... and honestly, I'm not even sure if she'd appeared before or after this issue. 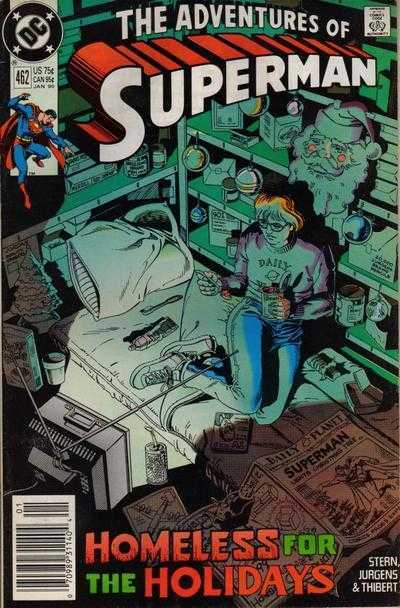 The plight of the homeless is interesting for a Superman comic... because it's one of those problems that his powers cannot solve. He can't heat-vision away homelessness. I always got a kick out of the cover of this issue. Alice sitting there, eating cold beans from a generic can. She appears to be quite a slob if the cover is anything to go by. Papers and half-eaten foodstuffs a strewn all over the storeroom. She's watching a small television... which makes me wonder where she hides it during the day. While we're at it... where does she stash her clothes, toothbrush, and miscellaneous what-nots? I gotta say, I love that she's actually decorated the storeroom for Christmas too! I'm not quite sure how old Alice is supposed to be. I get the feeling she's a bit younger than she looks. I suppose living in a closet for three years may add the years to one's appearance! Sticking with that... three years? That's crazy! Lois Lane is supposedly an incredible investigative reporter... you'd figure she'd almost have a sixth sense about things not being quite right. Further... we're to believe that Clark never heard Alice's heartbeat (or television set!) when flying past the Daily Planet building at night or on holidays? Didn't know you cared, Whit! Man, you have really pulled some comics out of my past the last week or so with "Dark Knight, Dark City" and now this issue! Keep it up bro, loving the blog. Thanks so much for your kind words, Joshua (and thank you for stopping by)! This is exactly why I'm doing this blog. Love revisiting and sharing these wonderful stories from yesteryear. If I can help take people back to the past with me, that's all the better!